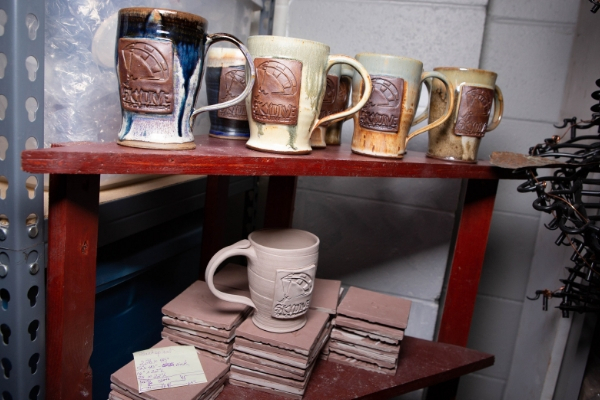 When it comes to business marketing, not much can beat a handmade mug with your logo emblazoned on the side. 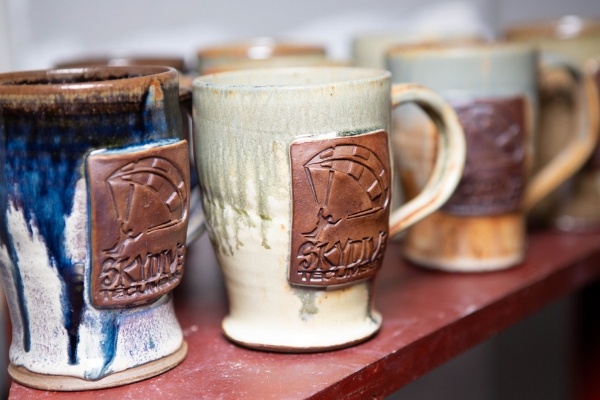 Even better is when your handmade mug is a collaboration between old friends celebrating mutual success in life! 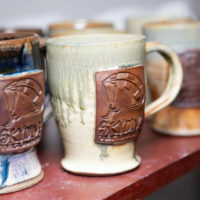 Karyn Konkel is the very talented ceramic artist responsible for these distinctive and useful mugs. She has been friends with Shannon Holland since college. Their friendship has evolved from college days to children born a few weeks apart to each managing businesses growing at a steady pace. 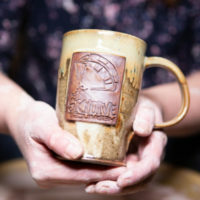 When the opportunity came along to commission the handmade coffee mugs with the Skydive Tecumseh logo, the project was a perfect fit for both parties. 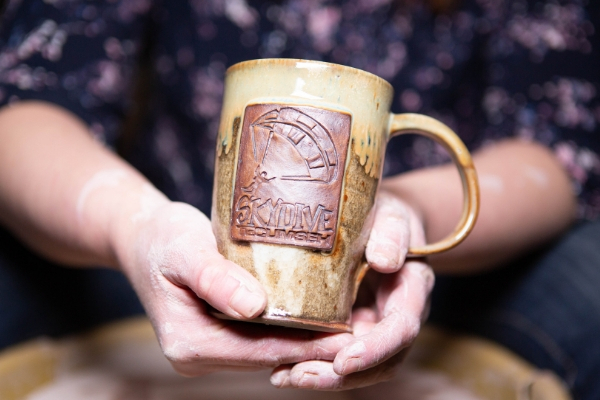 The beautiful stoneware mugs have been very popular with skydive customers, and there are rumors that another order is in the works for production soon! 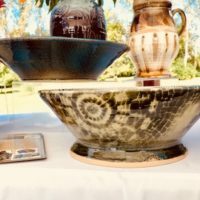 Karyn brings a wealth of education and experience to her clay works. Growing up in the Kalamazoo area she found creative outlets from a young age. Though not from a particularly artistic family she credits early exposure to piano lessons and art classes in school for the awareness of her creative side. 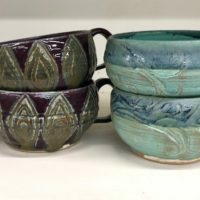 There was a pottery wheel in her high school art department that piqued her interest and admits she first fell in love with clay at the Kalamazoo Institute of Art. 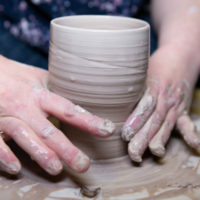 About that same time, the movie Ghost was popular, and she is quick to point out her career choice in ceramics had nothing to do with Patrick Swayze in that iconic pottery wheel scene, but rather the impact of seeing the female character making a full time living as a ceramic artist. 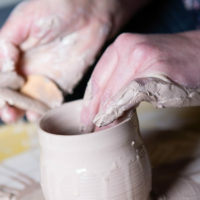 Karyn Konkel creating one of her beautiful mugs. 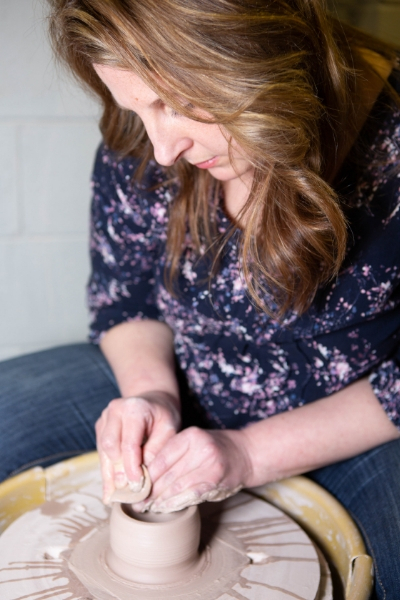 Karyn received her BFA in Ceramics from Siena Heights University. Despite the general notion in our society that life as an artist is sometimes unsustainable, Karyn has managed to carve out a successful business. From the beginning days of her career, she credits her willingness to work seven days a week in some less fulfilling production jobs and gallery gift shops to be immersed in the Arts. 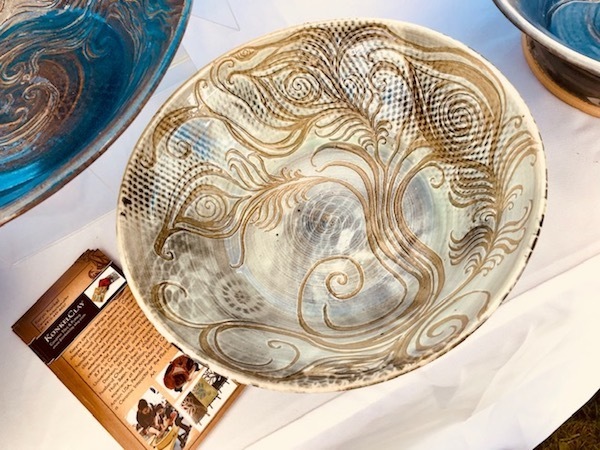 Karyn also credits her artistic growth with the exposure to the many artists encountered over the two years working at Pewabic Pottery in Detroit, Michigan. Eventually she used the knowledge she gained from these jobs to teach classes. This background brought her so many valuable lessons in how to manage her studio, and more importantly, made her realize how much she loves to teach. 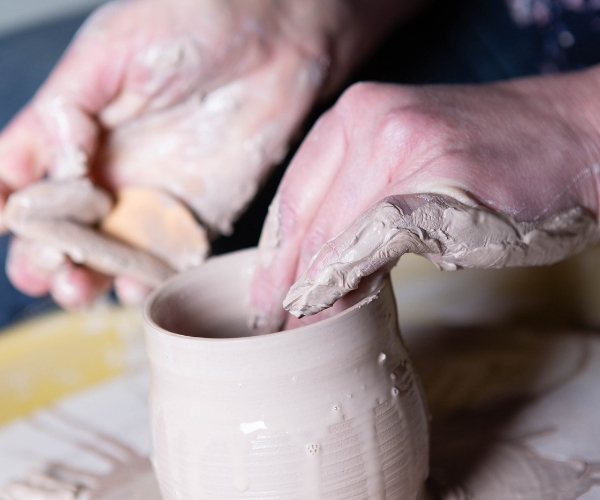 Currently, Karyn is a Ceramics Instructor at the Flint Institute of Art, in Flint Michigan. 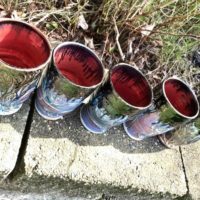 She teaches Tile Making, Wheel-Throwing, and Hand-Building techniques. The FIA offers classes for all ages and Karyn encourages parents to check out the programs provided for children and families. With public school funding often falling short for supporting art curriculum places like the FIA are thankfully stepping in to fill the gap. Karyn says teaching inspires her and she learns a great deal from her students through their creative expressions. 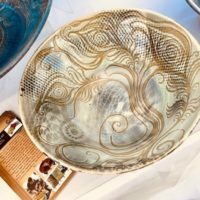 Working with clay allows her to indulge both her drawing and carving passions. Taking an idea from two-dimensional paper sketch to three-dimensional clay project and then spending time carving details into the clay is a form of meditation. 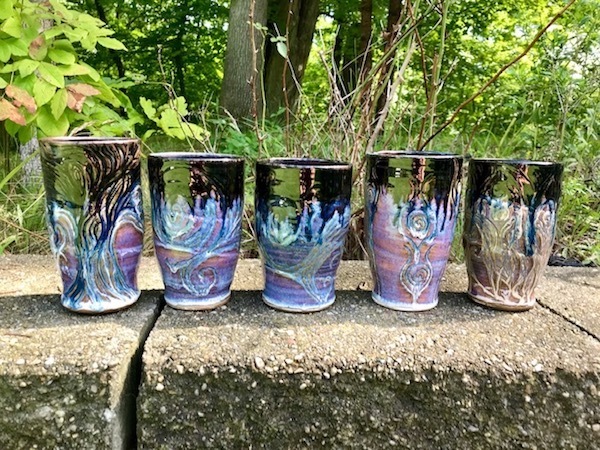 She creates pieces on a potter’s wheel or with hand building techniques but loves both equally. 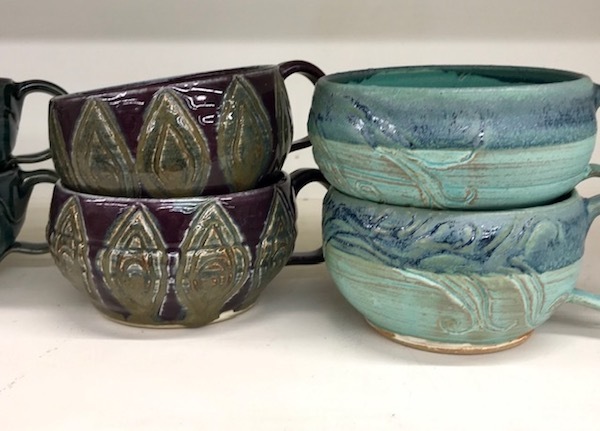 She enjoys working with porcelain clay for the delicate structures she can achieve, but her true love is working with stoneware. This heavier type of clay body allows a different feel, and the glazing process is more intense and often full of surprises. 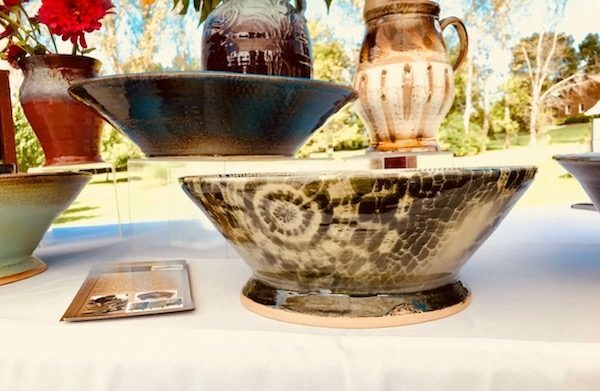 She works with both electric and gas-fired kilns and says teaching at FIA has been invaluable in helping expand her knowledge of working with different glazes and large gas-fired kilns. 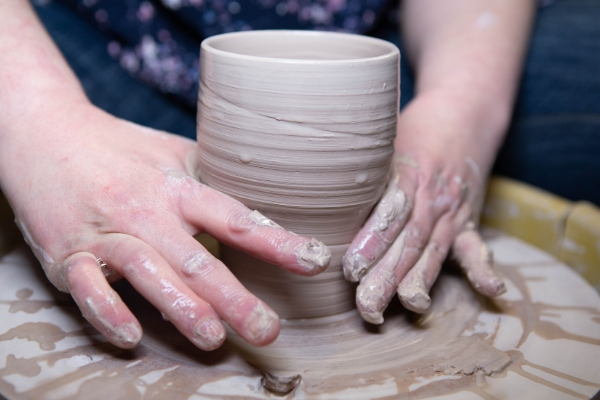 There is always something new to learn when creating with clay! Karyn is so grateful for the people that have supported her success. She has been able to pursue her artistic endeavors especially because of the commitment and encouragement of her husband. Watching her children grow offered different perspectives as she started seeing the small details of the world through their eyes. Teaching has kept her ideas fresh and ever evolving. Each student brings something new to the learning process, which she has honed into valuable lessons to pass along to others. Karyn says it makes her happy to create, but it makes her even happier when someone appreciates the beauty and function of something she has created. Karyn defines herself as a wife and mother first and an artist second. Teaching at the FIA is taking up a significant portion of her work life at the moment. She does occasionally accept custom jobs like the mugs for Skydive Tecumseh. 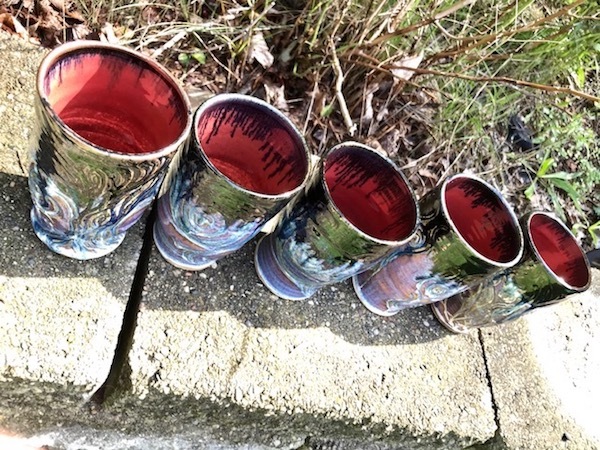 As time allows she takes requests for custom dinnerware and other fun projects. She is always willing to discuss future commissions! 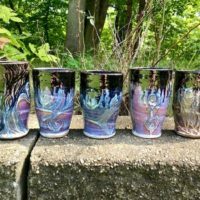 The best places to purchase her work are at the FIA gift shop, the Lansing Art Gallery, and at the annual Ugly Dog’s Farm Festival held each September in Davison, Michigan. And finally, the inevitable question: Does Karyn skydive? Despite living close to the drop zone location some years ago, she never found the time to jump. When asked if she would ever try the sport, there was a thoughtful pause, with a “maybe someday” for an answer. 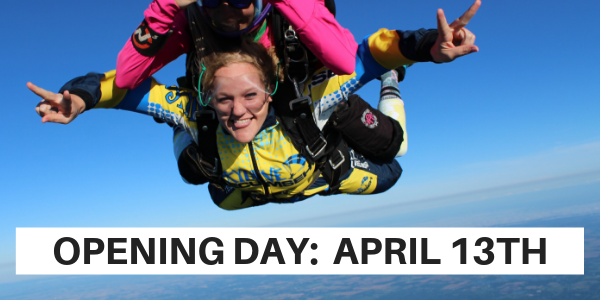 Skydiving would undoubtedly provide a whole new point of view to the creative process!! 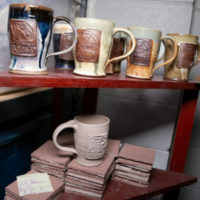 In the meantime, we should all fill our mugs and raise a toast to old friends, business collaborations and Blue Skies!